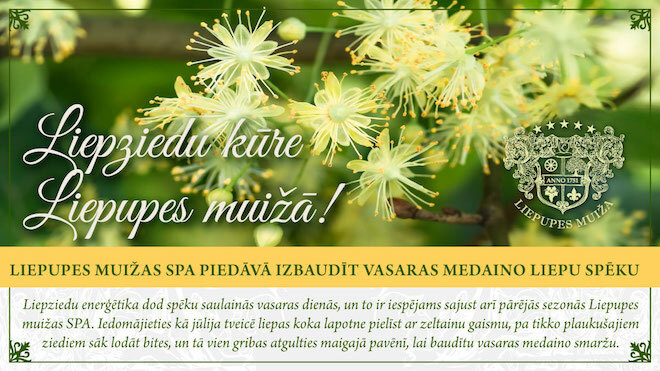 Linden blossom energetics refills us with its intensity on sunny summer days, and the same can be experienced at Liepupe Manor SPA special Linden blossom ritual. Imagine hot July day when sun refills the magic linden tree with gold light, on just assembled small flowers bees began to crawl...it makes us to dream about lie in the linden tree shade, to enjoy the summer honey-fragrant scent. Relaxation in a steam bath with freshly made herbal medicines and salt scrub (prepared with strong care from local healer Inta), the swim in linden blossom tub (60 min). After treatments we offer you to enjoy the linden blossom tea of Liepupe Manor and healthy snacks in our recreation room. Check out until 12.00 p.m.
*SPA procedure visit time should be previously aligned.